In minutes, you can have a tasty wrap made with hearty whole grains, which are beneficial for cognitive health and mental agility. Due to their phytochemicals and antioxidants, whole grains offer a whole host of brain-enhancing benefits, plus they offer anti-inflammatory protection, which has been shown to slow cognitive decline. Are you getting at least three servings of whole grains a day? The broccoli offers vitamin C, fiber, and beneficial B-vitamins like folate, which are helpful for heart health and help with brain health, too. A serving of vegetables a day can protect against cognitive decline and protect memory, which may be linked to Alzheimer’s disease. Plus, research shows that pulses like the black beans in this recipe offer protection against losing your mental sharpness. In a medium bowl, add the slaw, artichokes, beans, and cilantro; gently mix until combined. In a small bowl, whisk together oil, vinegar, mustard, yogurt, salt, and pepper. Pour over the slaw bean mixture. Toss together until well coated. Lay the wraps out on a cutting board. Place ⅓ of the slaw on each of the wraps. Roll them up and serve. Enjoy! 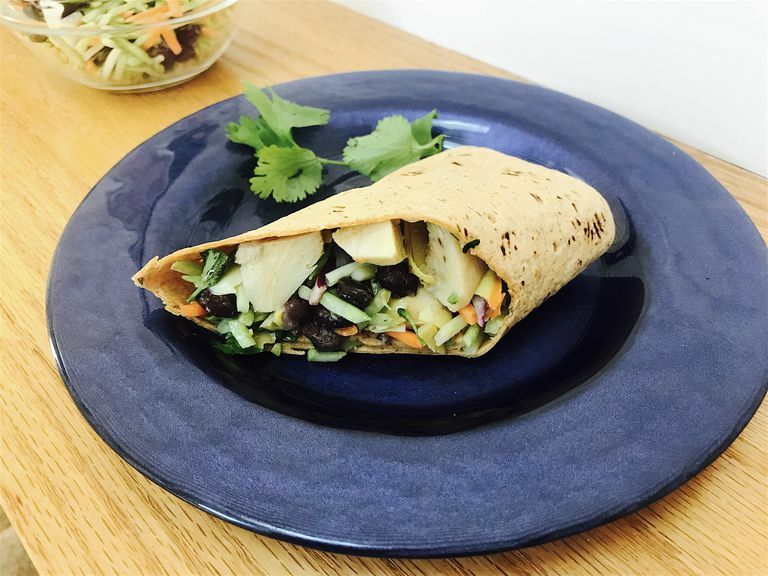 These wraps are tasty with a myriad of veggies, including sliced bell peppers, mushrooms, and cucumbers. Grill veggies for a different flavor and texture. Add heat with hot peppers or a hint of sriracha, or up the sweetness with a drizzle of honey in the slaw dressing. You can add a bit more protein with diced chicken or turkey breast, cubed tofu, or toss in some slivered almonds and chopped pistachios. Instead of slaw you can use chopped lettuce, spinach, or kale. Get creative with your greens. Feel free to toss in fresh herbs like basil, dill, or rosemary. Spread a layer of avocado or hummus on the wrap before adding the veggies, for a more creamy bite. You can heat up the wraps on the grill or in the microwave for 30 seconds to one minute prior to filling. Cut each wrap in half and serve with gazpacho or cucumber soup. It’s perfect for a warm summer day. This recipe also pairs well with a white wine spritzer or glass of sparkling water with a freshly squeezed lime.